A quick blog post from me this chilly but sunny Sunday morning as I have strawberries to plant and a herb garden to sort out. We've certainly had some weather this week - warm sunshine, chill winds, blue skies, grey skies, rain and even hail, all in the last few days. There may have been thunder at one point. I keep humming that Disney song about April Showers and hoping for another warm summer like last year. I woke early to a chill, blue-ish sky sort of day and, given recent unpredictable weather, thought I'd start with a stroll around the veg patch with my camera. A lot can happen in a week and I've not spent much time there as I've been planting up the new layout of the other garden I look after, the Car Park Garden, a space that I can actually look out onto. So what's happened while my eyes were averted? The veg patch is looking lovely having positively burst into blossom. Chive and wild garlic buds are shooting up, peony stems are now about 12 inches high, sweet cicely herb is in flower, and lovage and comfrey are growing with a vengeance. I say vengeance because both really need to be kept in check. There was a lot of colour from spring flowers (although the tulips have mostly come up blind this year and the daffs are pretty much finished), a few bees and ladybirds, and a surprise in the form of my first asparagus spears popping their heads up. It won't be long before I'm enjoying fresh purple spears with a poached egg for breakfast - yum! It seems early for asparagus but it's only a week ahead of last year, when we'd already had a couple of weeks of very warm weather to tempt the spears into action. Purple broccoli has now finished. I was buzzed by several bees as I dug them up - they'd been enjoying the flowers but I need to clear the space for this year's crops. And I've left a kale plant to flower for them. I'll collect the kale seeds to grow some micro greens later on. 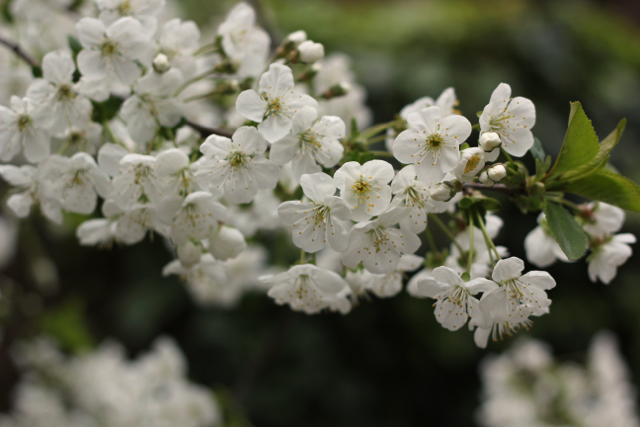 As expected, the Morello cherry trees are now smothered in white blossom, as are the pear and quince trees. Some calm weather to encourage pollinators to linger would be good but with a ground level nectar bar from forget me nots, honeywort, honesty, achillea and erysimum flowers to feed on, would they notice the clouds of blossom above? 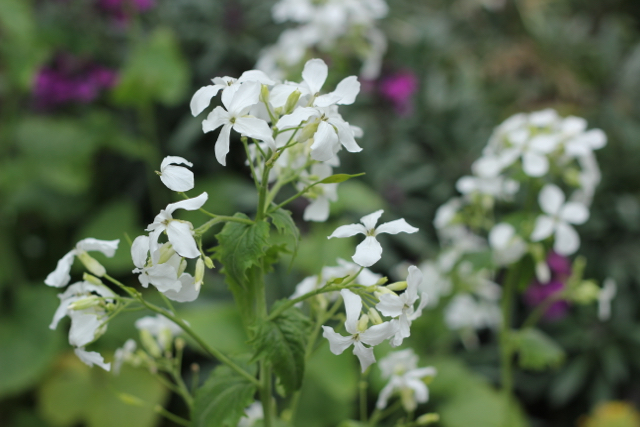 I spotted the Honesty (Lunaria annua) seedlings last summer and gave them room to grow. Lunaria was introduced to the garden a few years ago because I love the papery seed pods at the end of the year and bees love the flowers. And as they're a biennial, the plants flower much earlier than annuals - one way to have a succession of flowers in the garden! I'm very behind with seed sowing but now that warmer weather is promised (at least for the next couple of weeks), I'll be opening up the seed box this week and possibly also planting out my overwintered sweet peas. It's supposed to be 19°C/69°F by next weekend - I don't want to tempt fate but I think I'll leave my sunhat within easy reach. 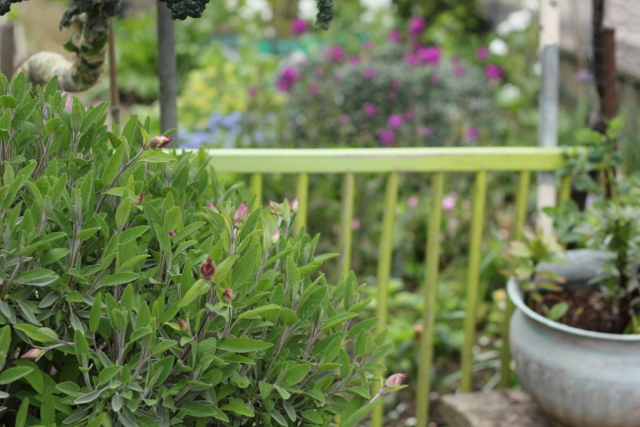 Lucky you, enjoying some nice weather (for the most part) - that sage looks glorious. I redid the herb bed a couple of years ago and haven't had any in the garden since - must remedy that this season. For one day in midweek it was just like a fine summer's day, Margaret, and I was outside like a shot! The mild urban climate means I can overwinter colour in my garden from established bulbs, biennials and perennials but your garden will catch up quickly I'm sure! It's amazing just how quickly everything grows at this time of year. A bitterly cold wind here today Caro so no gardening here although I did go to a plant fair :) Like you I'm hoping to get on with some serious seed sowing later this week and will be buying some new sun protection cream. Have fun! It surprised me that there were so many bees around when weather has been so cold.